Does Congress realise how out of touch they are with their constituents? Eric Massa a Democratic Congressman from Long Island who resigned because of allegations of sexual harassment spoke in an interview on radio station WKPQ AM about a bizarre confrontation with President Obama's chief of staff Rahm Emanuel, who was reportedly displeased with Massa's vote on Obama's health care proposals Massa was coming out of the shower in the Congressional gym reported as follows in the WKPQ interview. "I am showering, naked as a jaybird, and here comes Rahm Emanuel, not even with a towel wrapped around his tush, poking his finger in my chest, yelling at me." The most obvious question is the same as that asked by Eric Massa. 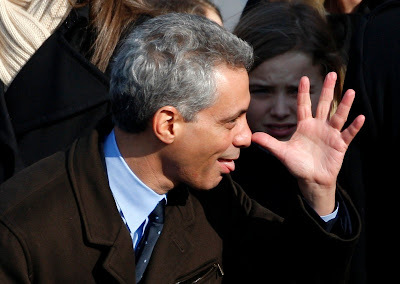 What business does Rahm Emanuel have getting in anyone's face when they are taking a shower? What is he doing in the Congressional gym anyhow? He is the president's chief of staff. Is he some kind of lunatic that he can barge in on someone who is taking a shower and collecting his thoughts? But what about the story behind the story? Congressmen get all kinds of perks from lobbyists that are too small to make it on the radar and they still get a Congressional dining room, a private pool and a private gym, which was the scene of the famous "Streakergate" in which Rahm Emanuel lobbied with his staff in full view. Why are taxpayers paying for such a laundry list of luxuries for our legislators? The people they represent are struggling with salaries that stagnate in jobs that are far from secure while those who represent them get by on what the market will bear. It would make a lot more sense to have private restaurants that cater to the legislative crowd and to have private gyms. As it now stands, they need speech writers (that we pay for) who create the illusion of empathy with the common man. It is hard to believe that legislators who are fawned upon by special interests, who vote themselves generous raises and perks, are capable of understanding the budgetary constraints of the vast majority of their constituents. If our elected representatives actually had to worry about lasting from paycheck to paycheck, their perspectives might change on how the rest of us live. When Rahm Emanuel barged into the Congressional showers, he showed America a lot more than his unhinged mental state. He showed us a flash of the pampered existence of our elected representatives. I suppose we should thank him for that. But he should not for get to take his medication before he comes to work. What Was That Song on the Radio ? 73 Year Old Man Beaten in Playground "Game"
Please Mr President ! Don't Campaign For Me! Psychiatry: An Art Or a Science ? Are the Lemba Really Lost Jews?